The previews of Windows 10 follow one another and are not the same. In recent weeks, the versions dedicated to testers have been rather rich in major new features and the latest one is no exception. What does Windows 10 version 18356 offer? It should be recalled that the test versions currently offered to Insiders contain the new features that should be available to the general public during the first half of 2019 via the first major update of the year. The main addition of this version is the arrival of a native Android mirroring feature. Mirroring allows a device (typically a computer) to display the screen of a smartphone or tablet by duplicating it. 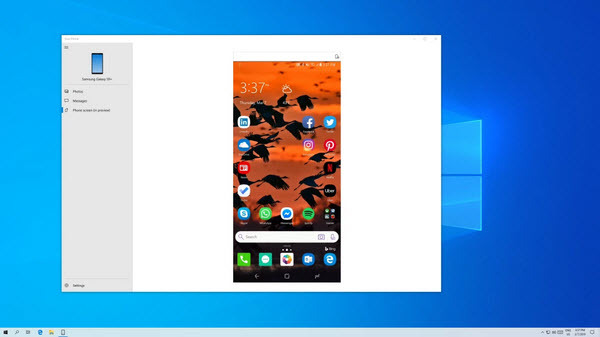 On Windows 10, this feature is called "Phone Screen" and displays your Android smartphone screen in a dedicated window. The user can then operate it from his computer without having to unlock it. At the moment, there are only 4 compatible devices: Samsung Galaxy S8, S8+, S9 and S9+. The devices must have at least version 7.0 of Android. The Android mirroring function is not a surprise. Among the latest innovations discovered in the preview versions of Windows 10, several concerned communication with Android smartphones such as the arrival of the "Your Phone" option. There is no doubt that Microsoft wants to highlight the complementarity of Android devices with Windows 10 and that this is certainly its main objective at the moment.